← Making digital journalism pay: doable. Making a living: difficult. The editor of The Journalist is a full-time salaried position, elected by the membership every five years. All members of the union are entitled to stand, with candidates being shortlisted by the National Executive. Ballot papers for this election will be distributed to members in early October, and votes have to be in by 5th November. Several motions about The Journalist were tabled at this year’s Delegates’ Meeting, with concerns raised about the quality, editorial breadth and focus of the magazine (including its relationship with head office and the communications department). Our branch delegates were mandated to vote on this but, frustratingly, too little time was given to that debate. How will you help journalists to do their job in the 21st century? How will you keep in touch with the concerns and issues facing all sectors of the union? And how will these issue be reflected in the pages of The Journalist? How will you balance union news and campaigns against professional interests? 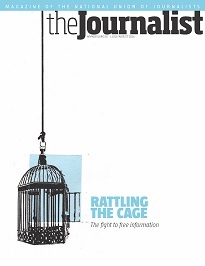 How do you see the relationship between the role of The Journalist editor and the NUJ communications office? How will you ensure that the quality of the magazine reflects the professionalism of the membership? How will you make it easier to read online? Since the branch meeting, we have found out that there are just two candidates for the post: Christine Buckley, the current incumbent, and Tim Dawson. Christine and Tim both have campaign websites. We hope they will both also respond to our questions: watch this space. We are disappointed that there are only two shortlisted candidates, and would have liked to see a larger and more diverse pool of people to choose from. However, we still feel that it is important to raise these questions and we hope this will help create some debate around the election. For members reading this: what are your priorities for the magazine and how would you like to see these addressed? For me, question 5 is key. Right now we don’t have an online magazine – we have a print magazine awkwardly put online. Your two options are to download the PDF or read it using ISSUU, one of those software programmes that simulates the experience of reading a print publication. I would like to see a truly online publication, with its own website, where each article has its own URL. This would make the content a lot easier to share and discuss online. It would also mean you could subscribe to the online content through an RSS reader. If you don’t get it through the door, there’s nothing to remind you when the magazine is available to read online, but being subscribed to the RSS feed would solve that problem. I don’t think there’s any need for anything fancy: no custom-built content management systems, no particular need for search engine optimisation, just a simple website with all The Journalist content on it.